San Diego Witch Creek Fire- The truth, how it really started, and what SDG&E, The PUC (Public Utilities Commission) and Cal-Fire, don't want you to know! This video demonstrates the cause of the 2003 Cedar, and Paradise fire. As well as the 2007 Witch Creek Fire. 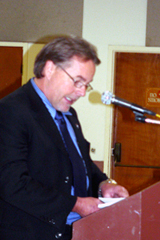 See Mr. Clark's deposition regarding the 2007 Witch Creek Fire. Download a copy of Ed Clark's eBook titled "Circle the Wagons SDG&E: The Perfect Corporate Cover Up". Ed describes his experience in uncovering the real causes of some of the most devastating fires in the Southern California area and San Diego Gas and Electric's attempts to cover up those findings. Here is the list of people who have been distributed a copy of the eBook. Let's see who shows leadership and who stands by and does nothing. Tell everyone what you think of Ed's findings, experiences, and the roadblocks he has encountered. 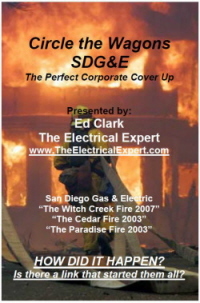 Ed Clark, The Electrical Expert and former Utility Electrical Engineer for Southern California Edison Company, in the interest of protecting public safety, has discovered and documented uncontroversial evidence regarding the cause of multiple fires throughout San Diego County from 2003-2007; namely the 2003 Paradise fire, the 2003 Cedar Fire and the 2007 Witch Fire. In the interest of protecting public safety, Mr. Clark attended and spoke at a recent Public Utilities Commission meeting regarding the past California wild fires. The evidence he presented is undisputable and supports the assertion that the condition that has been starting fires is being caused by improper installation of electrical facilities by the local utilities, has gone undetected for years "AND STILL EXISTS" within San Diego County and perhaps throughout Southern California. What caused the Northern California Wildfires? See East County Magazine's review of Ed's ebook entitled "Circle the Wagons SDG&E: The Perfect Corporate Cover Up". Read the follow on article about how SDG&E secretly replaced the power poles Ed identified as a fire hazard. Listen to Ed's radio interview on TruthBrigadeRadio.com See the details and listen. Read about Ed's efforts to bring visibility to a clear public safety concern. Ed's latest report regarding the cause for Southern California wild fires covered recently in the media. See the full story. See News Coverage of Ed's Conclusions regarding the cause of the Witch Fire. See the video.